Friends I must confess I am insanely frustrated right now. I’m on my third round of baking recipes for my Christmas goodies and nothing, absolutely nothing is coming out right. The first round all my brilliant ideas tasted horrible (I promise not posting those! ), the second round everything tasted fantastic but nothing would come out of the stupid pan, the third round burned everything. Ugggh! I know it’s not a life threatening crisis or anything but after baking all day to no avail, listening to my youngest yell at me all day (He’s learning to say more please, and we are making progress but there is still a lot of yelling involved on his part), and nagging my oldest for various things all day, I pretty much want to rip all my hair out. Or curl up in the fetal position and cry. Again I know it’s not the end of the world or anything when your baked goods don’t turn out…but still it’s just been one of those days. I figure most of you don’t necessarily attempt to cook four or five new desert recipes all in one day. But I bet most of you have had a cake that just didn’t turn out… perhaps like me it got stuck in the pan and you had to man handle it to dislodge the thing? And I bet also like me you were a tad frustrated. Maybe still needed a desert to take to a party? Didn’t want to waste a perfectly good tasting cake despite it being a crumbly mountain? Make a trifle. 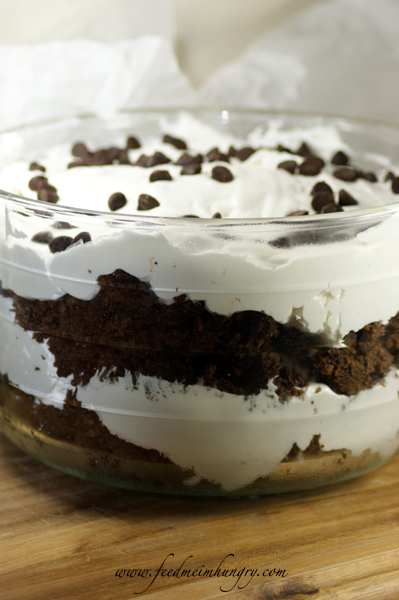 So a trifle (not to be confused with a truffle, lol) is basically crumbly cake, whipped cream, and fruit, placed in a clear bowl or high sided serving dish in layers. Feel free to omit the fruit if necessary. This desert is pretty and tastes great. You can totally pretend it was intentional that you decimated your cake when removing it from the pan. Perhaps the best thing of all you can totally do this with brownies, pie, whatever. 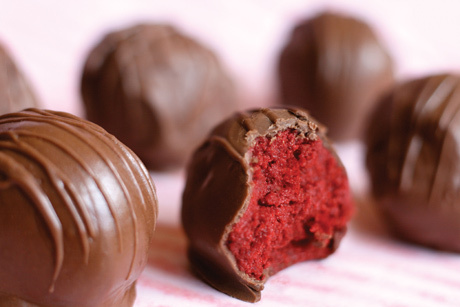 Make cake balls. These are cute and of course taste good. People will actually be super impressed with you if you make them, so again you look pretty smooth with your fancy desert when you walk into the party. The downside is that they are a little time consuming to make. To make basic cake balls, mix two parts well crumbled cake with one part frosting. Shape the mixture into small balls and place on a cookie sheet lined with wax or parchment paper. Place in the fridge or freezer to chill well. Coat the chilled balls in candy quick to seal them. You can check out this recipe from Bakerella on Epicurious for more specifics. Of course there is a third option: leave the cake in the tupperware. Pour frosting over it. Send it to work with husband and several spoons. I promise if it tastes good it will get eaten anyway.